Transpacific flights are painful. Most people are absorbed in movies. Their screens combine into an eery glow overhead. A mother paces up and down the aisle in an attempt to keep her baby from disrupting the whole cabin. While the guy next to you has been snoring for hours. You try to read and then sleep to no avail. So you just end up watching the map of the airplane inching across the ocean. First, you watch the West Coast slowly disappear. A few hours later, Hawaii starts to come into view. After that, the ocean seems endless. So you practically feel giddy when another island appears on the screen. Even more so when it’s one whose name you’ve never heard. Minami-Tori-shima is one of those islands. Its name sounds Japanese. But it’s in the middle of nowhere. 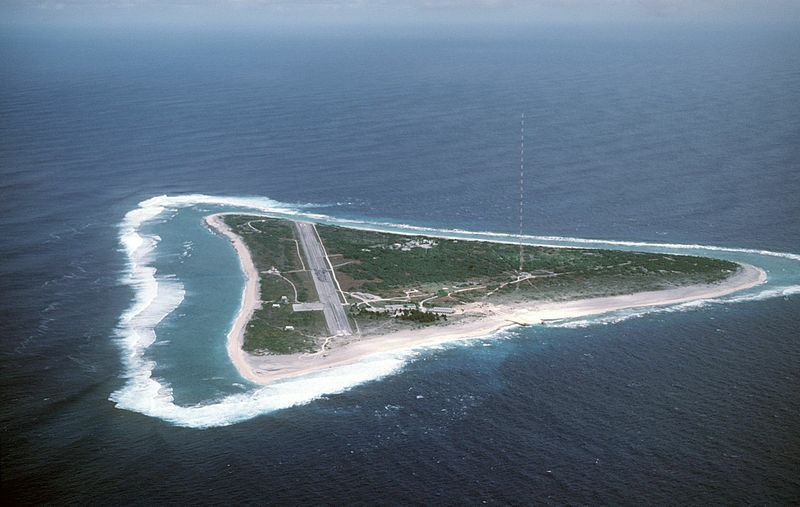 It looks like it’s about halfway between Tokyo and Wake Island. The Mariana Islands are probably the closest islands to it. It’s shaped like a triangle with its outer rim raised slightly higher than the rest of the island. Plus it has an airport. Or at least a runway. So someone has been there. You just can’t imagine that people live on such a remote island. It turns out you’re partially right about Minami-Tori-shima. It is a Japanese island—the easternmost one, in fact. But it hasn’t always belonged to Japan. A Spanish sea captain discovered it in 1694. The United States claimed and named it Marcus Island in 1864. Then the Japanese annexed and renamed it in 1898. Both countries continued to claim the 300-acre island for decades. Tensions didn’t really escalate until World War II, though. That’s when the Imperial Japanese Navy built a meteorological station and an airstrip. The United States retaliated by bombing and attempting to capture it. The Treaty of San Francisco gave it to the United States following the war. It was eventually returned, save for control of the airstrip, to Japan in 1968. As for the elevation, the center of the island lies three feet below sea level. It’s surrounded by a shallow lagoon and a fringing reef. The depth of the water quickly plunges over 3,300 feet outside of the reef. Giant squid and swordfish call the water home. Today, Minami-Tori-shima is uninhabited. It’s meteorological station is still used to study typhoons. It’s a radio station, as well. Since its airstrip can’t handle large aircraft, few scientists have had the chance to visit the island. That might change soon. Huge quantities of rare earth metals, used in everything from cars to electronics, were recently discovered here. Japan, like many other countries, has largely depended on China for these elements. Only time will tell, but this little island in the Pacific could be a game changer for the Japanese economy. It became a good distraction on a long flight, as well.